Sunday, November 5th, 2017 11:00 am – 6:00 pm. ● 100+ Exotic and Luxury Automobiles competing for $500 Cash! ● Fire Truck Pull Contest – teams competing to pull an actual truck! ● Entertainment – Live Music from the Ben Allen Band! ● Craft Beer Garden – Naples Beach Brewery, Bury Me Brewing, Islamorada Brewing, and Big Top Brewing and more! ● VIP Wine Area – complimentary wine tasting & Stella beer, silent auction, raffle, hand-rolled cigar booth. 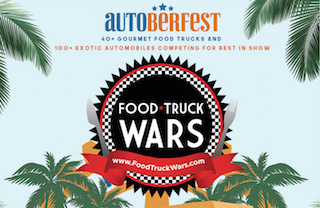 Interested sponsors, food trucks, car clubs, or individual owners please contact: autoberfest@gmail.com | 434-426-6748. Naples Pelican Bay Rotary Club – A portion of the event proceeds benefit Collier County charities and local Irma Hurricane relief efforts.